Over a number of years the marriage between Dean (Ryan Gosling) and Cindy (Michelle Williams) has corroded. The film moves back and forth through time, showing how they first met and fell in and out of love. In the present there is a complete lack of romance between them, as they balance their working lives and their relationship with their young daughter. When they first met though, Dean was starting out as a furniture removalist and could charm his way through most situations. Cindy was in college, studying medicine and had a boyfriend who was on the wrestling team. In these flashbacks we see Cindy looking after her sick grandmother. She meets Dean by chance one day when he is in the same building as her, redecorating a room for someone. He immediately becomes infatuated with her and persists in trying to meet her again. There have been numerous films that have chronicled the progression and detours of relationships throughout cinema. Woody Allen's masterwork Annie Hall (1977) is still the very best example of this, a near-perfect fusion of comedy and drama. More contemporary additions that have played with both form and time, too, such as Eternal Sunshine of the Spotless Mind (2004) and (500) Days of Summer (2009). 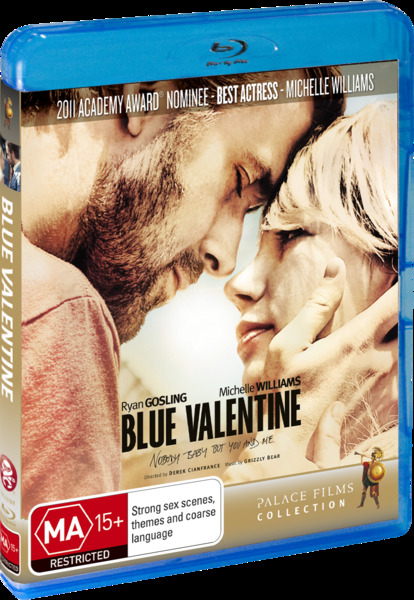 Blue Valentine, directed by Derek Cianfrance, lacks the glossiness of the latter. It's visually derivative, filmed with grainy, muted colours and tight framing but it's also more intent in trying to explore and develop character. It distinguishes itself from similar films by providing the most minute and intimate details for both of its central characters. The opening scenes are set in the present and Dean comes off as a dishevelled, boorish thug, swearing openly as a driver speeds past his home. The film then cuts back to an earlier time when he started off as a removalist. He bumbles his way through the interview but we see a more compassionate side to him when he redecorates a sickly old man's room. The juxtaposition of these scenes rounds his persona in such a way that it is impossible to have an entirely unfavourable perception of his character. From the comparison of these scenes there is a more tragic sense that Dean was once a decent young man who never grew to face life's more demanding responsibilities. Impressively, Cindy's story is given equal value to the narrative. There is a suggestion that as a result of her strict religious upbringing and her abusive father, she was rebelling against these forces through Dean. She too holds some deeply troubling and disturbing secrets of her own. The non-linear structure is fluently controlled by Cianfrance, easily distinguishing the past and present through the changing looks of the characters. It is employed not as a gimmick but as a powerful technique to enrich the depth of character through a completely honest view of their inner lives. Both Dean and Cindy are deeply flawed beings, but the contrast between their most damaging secrets and their more compassionate moments means they cannot be judged simplistically. It is an extremely confronting film at times, grounded so realistically that the later portions of the film are agonisingly difficult to watch. Gosling and Williams, who are both executive producers of the film, are so truthful to their characters here that they will likely both be nominated for Oscars early next year. Gosling has a particular fine understanding of the film's structure and creates an entirely believable contrast between Dean's personality from when he was young and when he is married. He shifts effortlessly from being a kind, funny but slightly frivolous young man to an older, more grizzled and suppressed individual, weighed down by his own aggression and a lack of affection. Williams has the quieter part here, drawn from the way in which Cindy's life has been continuously suppressed and dominated by male figures, from her father; her boyfriend in college and then eventually Dean. It is a consistently moving and emotional performance from her. Both actors blend themselves so thoroughly into these parts that Blue Valentine becomes as confronting and as personal as an onscreen relationship can be.